La Baruné, an exceptional 4-star guest house, uniquely decorated and furnished with all the luxuries that you will need to enjoy a comfortable and relaxing stay. The guest house consists of eight luxury double bedrooms with king-size, queen-size and single beds, all with en-suite bathrooms, air-conditioning, flat screen televisions and DSTV. We also offer our guests free high speed wireless internet, which makes this guest house a perfect stopover for businessmen and women. Enjoy a mouth-watering breakfast on the patio, next to the crisp pool and experience the tranquil sound of the Koi pond and water features in our well-maintained garden. We are situated in Aquapark, an undisturbed neighbourhood in Tzaneen and located right outside the Tzaneen Central Business District, which makes it convenient for guests to take care of all their shopping and business needs. We are only 1 km from the new Tzaneen Lifestyle Mall, Oasis Shopping Centre, the Tzaneen Medi-Clinic Private Hospital and the Tzaneen dam. In addition we boast with beautiful settings and surrounds, elegantly styled rooms and a sparkling pool to cool off in after a hard day at the 'office'. Our freshly prepared breakfast may be enjoyed either indoors or on the patio overlooking the pool. Your background music is that of the gentle sound of the cascading water of the koi pond. The sole aim of our friendly and efficient staff is to make your stay enjoyable and unforgettable. We endeavour to give you the personal touch whilst still giving you your space. Our tariffs are highly competitive and special tariffs can be arranged for long-term stays. We will gladly forward the relevant info to interested parties. As the saying goes once you have tasted the waters of the Letaba river, you will be back. This too applies to the warm hospitality you will experience during your stay at La Baruné Guest House. 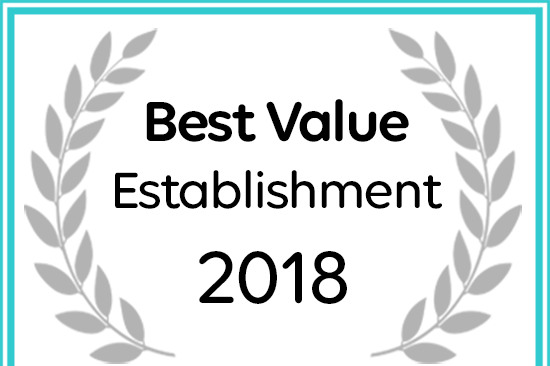 La Barune Guest House has been named a Best Value Establishment by Afristay.